Vacation's Over, this Norman Rockwell painting, appeared on the cover of The Literary Digest published August 27, 1921. The alternate title for this illustration is Girl Returning from Summer Trip. 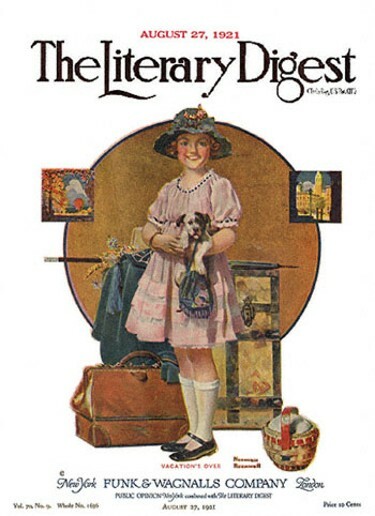 This illustration was Rockwell's twenty-ninth picture featured on the cover of The Literary Digest. Starting with the first cover in 1918, Boy Showing Off Badges to the last, The Night Before Christmas in 1923, Norman Rockwell artwork was published on The Literary Digest cover forty-seven times in all. This illustration was reproduced on page 56 of Norman Rockwell, A Definitive Catalogue by Laurie Norton Moffatt. Norman Rockwell evokes childhood memories with this illustration. He masterfully captures the excitement of returning home. Vacation's Over was only one of 47 Norman Rockwell Literary Digest covers; here is the list of more Norman Rockwell Literary Digest scans. The little girl is returning from her vacation trip. She obviously enjoyed her trip. Two of the places she visited are shown in the insets on either side. She is smiling, even though her vacation is over. She is probably glad to be home. The painting shows that she carried a lot of luggage. We see a trunk and a carry-on. She also has her lunch basket. The hat she is wearing looks new. Her old hat is laid on top of her trunk along with her umbrella her coat. Did she bring the puppy back with her or was he a welcome back present from her parents. Norman Rockwell revisited this theme with the Saturday Evening Post cover, 1940's Girl Returning From Camp.